Having been a QRP contester for almost 2 years now I have concluded that this is a really good time in the hobby's history to be doing this. The reason is technology. We often tend to think of recent technological progress assisting the more serious big-gun contesters (networked logging, global spotting, remotes, antenna design, etc.). Of course the technology also helps average and even smaller stations. What I want to argue here is that QRP contesting may be getting a better-than-average return on modern technology. The technology I want to look at is not stuff like transceivers and station software since both big and little guns often use the same stuff. It's networking where I believe the benefit lies. First we need to understand just how challenging QRP can be in a contest environment. My antennas are typical of suburban hams -- tri-bander & wires -- so we're equal in that. But when I run 5 watts I am -13 db weaker than the more typical 100 watts (barefoot) station. This grows up to -23 to -25 db below full legal limit stations. That's a lot when you consider, as hams, we'll endlessly argue about or waver on spending money over 0.5 db of transmission line loss or 1 db more yagi gain. Let me give you a concrete example of how weak my QRP signal sounds at the other end of the QSO. 3V8SS in Tunisia recorded all his contacts in the recent ARRL DX CW contest. 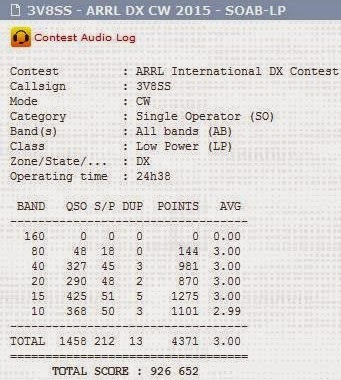 I placed well among the claimed scores in the QRP category of that contest. Go to 3V8SS's contest page and click on the link (upper left) to bring up a search box where you can enter my call (VE3VN) or any other call. Then select the found QSO (by band) to listen to 1 minute of streaming audio containing the selected QSO. When you finish listening (and stop laughing) you'll understand what I'm up against. When calling other stations I am usually unable to get through when someone else simultaneously calls the other station. Even then I frequently need to repeat my call or exchange. Calling CQ is a particular challenge since on a busy band my signal is an easy one to overlook, and that's on CW with narrow bandwidth filters. This is where technology comes to the rescue. Spotting only helps if you're sitting on a frequency and calling CQ (running). Someone who hears or works you spots your call and frequency via one of the hundreds of gateways to the global spotting network. Other see the spot and, if they haven't yet worked you, QSY to your frequency and call. Both general logging and contest software make this as simple as a single click. The software may even highlight whether the station is needed and a new multiplier. I was only spotted once during the contest, which is a little disappointing. Yet I was still quickly besieged with callers many of the times I started calling CQ on a new frequency. This brings us to another bit of technology that brought callers to my frequency. Spotting networks only work if someone somewhere makes a conscious decision to spot you (note: never self-spot, and it can even get you disqualified from a contest). CW skimmers take that element of uncertainty out of the picture. 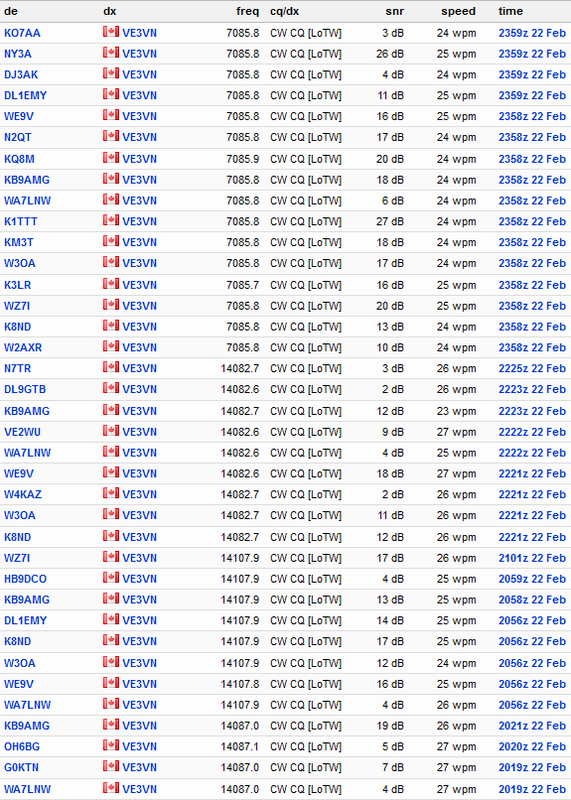 There are a many stations around the globe running CW Skimmer by VE3NEA, or similar software, on a spare receiver. They may or may not be located at stations active in the contest. Unlike spotting networks skimmers automatically scan the bands and report on activity. Primarily this is stations calling CQ or otherwise holding a frequency and inviting callers. While a standalone skimmer node has some value to its operator it becomes far more powerful when combined with other skimmers. This is where the RBN comes in. Since the linked sites on CW Skimmer and RBN describe these technologies in detail I will skip their descriptions here and jump directly to showing why skimming and RBN are so useful to the QRP contester. Let's do this with an example. The adjacent picture is an image of the RBN search on my call in the final hours of the ARRL DX CW contest last weekend. As you can see I am getting a multitude of reports of my running attempts, often many every minute. It should be obvious that this is far more productive than relying on other hams to spot me. Most are not motivated to do so in my case since VE3 is hardly an attractive catch for anyone. Besides, most human operators will pay little attention to a signal as weak as mine. Not so the software. You can see where I spent the final 2 minutes of the contest by calling CQ on 40 meters. It was a way to spend the time since I knew I had little chance of finding someone new in the time remaining. I was quickly answered by 9A8M, which turned out to be my final QSO of the contest. As I ran down the clock the skimmer spots just kept coming on RBN. Notice the posting of the SNR (signal-to-noise ratio) on each spot. As with the 3V8SS recording referenced earlier you get an idea of how weak I am at many stations. I have few skimmer spots on 40 from the west coast or Europe. That absence of spots most likely indicates that I was below the noise or covered by QRM. This is useful feedback. On 20 and higher bands I fared better with my CQs, as you can glean from the earlier RBN spots. Even if you're running QRP or small antennas you must spend time calling CQ in a contest if you are to build up your score. Many little guns or casual participants only call other stations, so if you never call CQ you won't work them. That costs you points. In the ARRL DX CW I made a point of calling CQ as often as possible in the final 12 hours of the contest since by then even the big guns are prowling the bands searching for contacts. With a small number of human-operator spots the existence of skimmers and the RBN is a boon to little guns. Although many S & P operators may pass you by because you are so weak the multi-operator stations and those entering in "assisted" categories will pay you a visit when you appear on RBN. Thus you get a bigger boost from RBN than the big guns, who are stronger and more often spotted or called by the S & P crowd. So call CQ and let the technology out there help to boost your contest score. Well, at least in CW contests. SSB skimmers will take a little longer to come along.